I have looked better, I just can't remember when. My name is Becky Casady. I am an old woman. I live out in the wilds of Iowa where the coyotes howl in the night. We (me, husband, kid, cats, dogs, pet mice, toads, ducks and fish) live in a log cabin, with two wood burning stoves for heat. Life is simple, life is good. 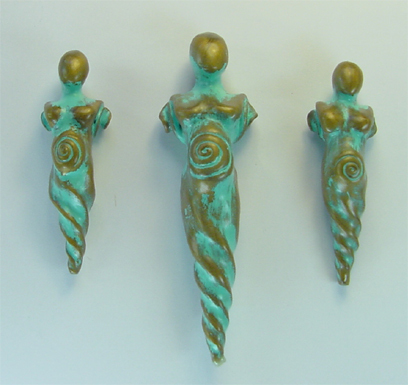 I have been sculpting since I was a wisp of a thing. I would collect the finest worm castings as my medium in my earliest years, moving on into soap carving and then plastilina. The last couple of years I have been exploring the world of polymer clay, I adore working with the clay because of it's vivid colors, abilities and it's forgiving nature. I joined the Central Iowa Polymer Clay Guild, I read the newsgroups and tried to do the chats (I am a very slow typist - it was hard to keep up), bought the books, I took classes from Maureen Carlson, Katherine Dewey, Sarah Shriver, Diane Keeler, but I never completed one blessed thing. Lots of failures, given-ups, bits and pieces. 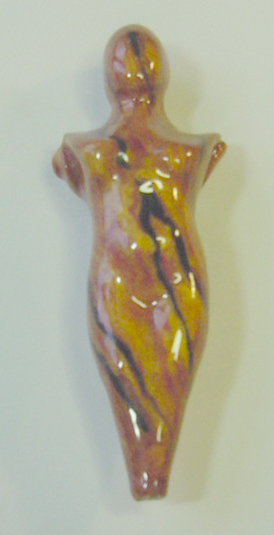 Then one day I created something - a goddess bead of sorts. It just sprung from my hands. It was a twisted sister to a goddess bead. I could relate to it immediately. I connect with each bead during its creation, I can feel the innocence, or the tightness of the belly, the conviction of the bead - I guess I am just a twisted sister. Life has it's ways of twisting us as we grow. I look around and see other twisted sisters, some of my closest relatives and friends are twisted sisters - you know who you are! This website is updated on Fridays with new items for sale. 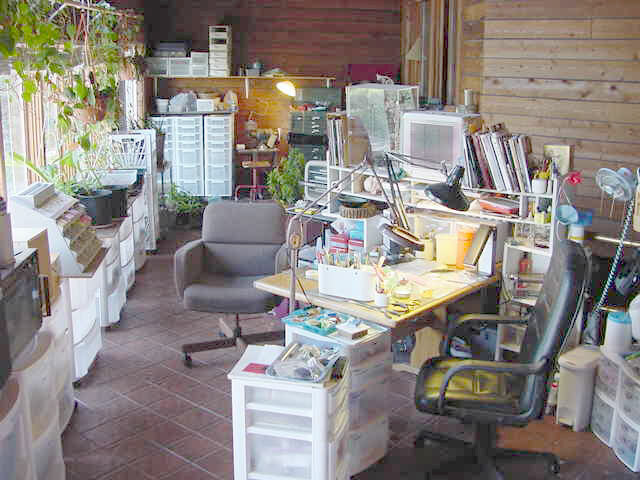 Please come back and visit my studio again. All my work is baked thoroughly in convection ovens with a digital Fluke thermometer for temperature accuracy. I use quality polymer clay and artists paints in my designs. I am offering several of stringing options of Twisted Sister beads for your various design considerations. A verticle hole through the bead from the head to the toe area. A sterling silver loop at the top. A gold filled loop at the top. A hole going from ear area to ear area. I sell Twisted Sisters off this site, at Ebay, and during bead shows in the Midwest. Each one is different with it's own quirks. Each one is sold with it's own attitude. They typically range from 1 1/2" to 5". and are light weight as I use polymer clays. I sand, polish and seal to give extra strength and gloss. This is where I work and play in clay. It never really looks like this when I am working. It is missing the two dogs and a couple of cats pestering me for attention. The far wall has the grinder and to it's right is the drillpress at one end of a workbench and a food processor at the other. My ovens and refrigerator are on the left and the varmint hair sucking machine is above the table on the shelf and clay is everywhere. There is ample room for me and a companion or student. Your guide to artists and art information on the Web.